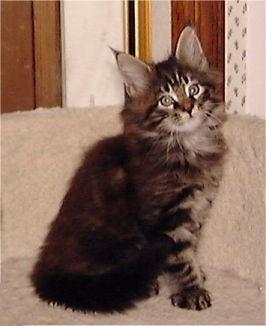 The kittens are pictured above at about eight weeks of age. Bonnie is a sturdy, spunky little girl. 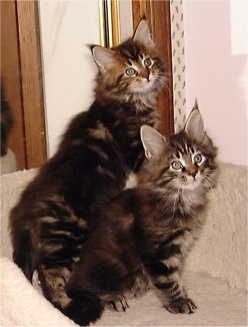 She is nearly as big as her brother, with excellent boning and beautiful toasty warm brown coloring. Bonnie is friendly, intelligent, and curious. She's into everything and afraid of practically nothing. (Even the vacuum cleaner is more of a curiosity than a threat.) 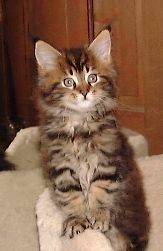 Bonnie has gone to a show home, and is now known as Pinecoon's Kokopelli of Cabincoons. Clyde is just a sweetie. He lets his sister boss him around -- not because he's a wimp, but because he's too good-natured to make an issue of it. He loves people, water, and rolls of toilet paper. He is smart and persistent, and nearly always figures out how to get what he wants.